The new face of Raw will be decided Sunday, Aug. 21, at SummerSlam, when Finn Bálor and Seth Rollins compete to become the inaugural WWE Universal Champion. The historic matchup — Bálor’s debut on WWE pay-per-view — was made official on July 25, the same night that Raw Commissioner Stephanie McMahon revealed plans to introduce the Universal Title. According to Raw management, the newly sanctioned championship will eventually outstrip SmackDown Live’s WWE Championship in importance. Rollins, who was selected No. 1 overall in the WWE Brand Extension Draft, was entered into contention by Stephanie. The announcement came less than 24 hours after The Architect failed to win the WWE Championship from Dean Ambrose at WWE Battleground, though it was Roman Reigns — the other participant in the championship Triple Threat Match — that lost the deciding fall, not Rollins. As Finn Bálor stares down his Steel Cage Match against NXT Champion Samoa Joe, the challenger contemplates not just regaining NXT’s top prize, but also his role as locker room leader. Finn Bálor was approaching an unprecedented 300-day reign as NXT Champion. Enter a fateful night in Lowell, Massachusetts, on April 21, and Bálor’s life took a dramatic turn. It was on that night that heated rival Samoa Joe defeated Bálor and captured the NXT Championship. “It was definitely a feeling of surrealism,” Bálor revealed to WWE.com. “You tend to picture winning the championship. You always have the dreams and vision of how you are going to win, but you never imagine how you are going to lose. I remember feeling like an ant laying on the mat with Joe standing over me. It seems only appropriate that Bálor will have a chance to rid himself of that doubt when he challenges Samoa Joe for the NXT Championship at NXT Takeover: The End… on June 8. Adding to those raised stakes is the fact that both men will compete for NXT’s most prized possession inside a steel cage. History has shown that Bálor has indeed thrived in first-time scenarios. Last August, he successfully defended the NXT Championship in his first career Ladder Match against Kevin Owens. “I’m going to have the same attitude I had in that Ladder Match,” Bálor insisted, “and I’m not going to leave anything behind.”. To walk in Bálor’s shoes is to walk in the shoes of a man whose championship reign trailblazed a path on multiple levels, from winning the NXT Championship in Japan (where he solidified his international status as one of the top competitors in the world), to successfully defending it in London (where both family and friends were on hand to witness the stunning career growth of the Irish-born Superstar). For now, however, the role of “true champion” is defined by the wrecking machine known as Samoa Joe. What kind of damage will Joe and Bálor inflict upon each other inside a steel cage? The answer most certainly involves brutality and aggression. Yet, with Samoa Joe looking more intent than ever to prove himself as NXT’s top dog, will Bálor be displaced as champion on April 1? Or will The Demon come out in Dallas to silence the threat? Watch Samoa Joe and Finn Bálor go toe-to-toe for the prestigious NXT Championship at NXT TakeOver: Dallas, when it airs live on WWE Network Friday, April 1, at 10 p.m. ET/7 p.m. PT. NXT Champion Finn Bálor has faced – and survived – every test put in front of him since winning the title last July. The champion’s resolve puts him among the elite in NXT history, as he comes closer to having the longest NXT Championship reign ever. Seeking to test the champion once again, NXT General Manager William Regal has lined up a major opponent for Bálor: The Superstar who held the NXT Championship longer than anyone, and The Man That Gravity Forgot, Neville! Can Finn Bálor once again show the tenacity that brought him to the top of NXT, or will Neville show that no NXT Champion, past or present, is greater than him? Find out this Wednesday at 8/7 C, only on WWE Network! Samoa Joe has asserted his dominance over NXT Champion Finn Bálor in recent weeks in hopes of getting the title match he’s been in search of. The submission specialist gets his much-desired opportunity when he challenges Bálor at NXT TakeOver: London on Dec. 16. Things weren’t always so heated between the two. In fact, they seemed to share a great respect for each other. The NXT Champion and Samoa Joe joined forces in the Dusty Rhodes Tag Team Classic and ran roughshod, defeating The Lucha Dragons, Enzo Amore & Colin Cassady, Dash & Dawson and Baron Corbin & Rhyno on their way to victory. After celebrating their historic victory, Joe asked for an NXT Championship Match, which Bálor was more than happy to grant his friend. However, NXT General Manager William Regal stepped in to inform Joe that, instead, he would have to earn the title opportunity by winning a No. 1 Contender’s Battle Royal. After Tyler Breeze yanked him out of the running, Joe went on a rampage, destroying Prince Pretty in a one-on-one battle before setting his sights back on the NXT Title. Samoa Joe looked to be helping out Bálor when he ran off Baron Corbin after The Lone Wolf ruined Bálor’s defense against Apollo Crews, only to shock the world when he viciously attacked the NXT Champion, leaving him out cold in the middle of the ring after a Muscle Buster. Joe explained his actions the following week, stating he believed he was owed an NXT Championship Match, and that since Bálor didn’t stand up to Regal and give Joe the title match, he had to do what he did. A furious Bálor charged to the ring and confronted Joe, only to be put to sleep when the wily veteran locked him in the Coquina Clutch. Joe has gotten the upper hand on Bálor now. Will it be the same when they square off for the NXT Championship? Find out at NXT TakeOver: London, live on WWE Network, Wednesday, Dec. 16 at 3 p.m. ET/12 p.m. PT! The rematch was announced by NXT General Manager William Regal at San Diego Comic-Con International, where both Bálor and Owens took part in a packed panel presented by Mattel, featuring the unveiling of both Superstars’ first WWE action figures. 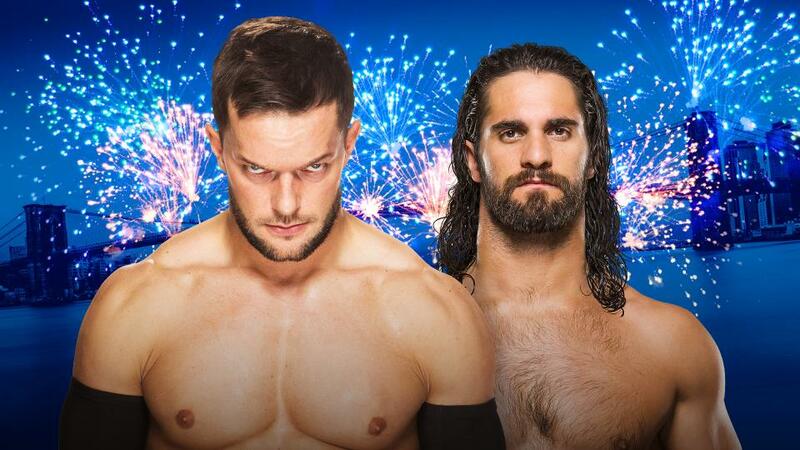 The announcement comes hot on the heels of Bálor’s stunning championship victory in Tokyo. Just days after becoming the first competitor to pin Owens inside an NXT ring, Bálor returned to Japan, the country where he first made a name for himself as a competitor, donning his demonic war paint as he charged into battle against the brutish Owens. While Owens sought to slow down his otherworldly opposition, Bálor withstood Owens’ onslaught and crushed him with the Coup de Grace to become the NXT Champion. Since the Tokyo throwdown, Owens has turned his attention to capturing John Cena’s United States Championship, but don’t think for a moment that the bruiser won’t relish the opportunity to reclaim the title that propelled him to Superstardom and embarrass Bálor in the process. Will Finn Bálor prove that his victory in Tokyo wasn’t a fluke, or will Owens send The Demon back to the netherworlds and reassert his dominance over NXT? Find out at NXT TakeOver: Brooklyn on Saturday, Aug. 22! Tickets will be available for this monumental event starting Saturday, July 18 at 12 p.m. ET. If you can’t make it to Brooklyn, don’t worry, as the event will be broadcast live on the award-winning WWE Network!